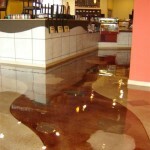 Epoxy coatings are the best flooring option in restaurants, commercial kitchens and food prep areas. Specialized systems withstand sudden changes in heat and cold. 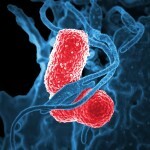 They withstand hot water cleaning pressure. We install & coat perimeter moldings. 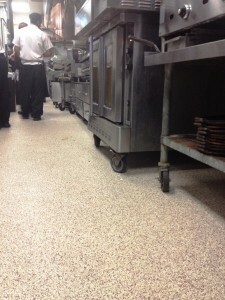 At Hardrock Coatingz, we understand flooring is an important part of a successful food service operation. You expect your floor to stand up to significant foot traffic, temperature changes and heavy equipment while also being non-skid, safe and sanitary. 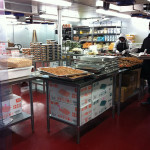 We provide custom commercial kitchen epoxy floor coatings that meet all of your needs at an affordable price. We have many systems available depending on your requirement and budget. Epoxy coatings for commercial kitchens are far superior to tile with grout. A seamless epoxy coating does not harbor grease, dirt and bacteria making for cost saving maintenance and health code compliance. Restaurant floors commonly become coated with oil and grease, increasing the risk of slip and fall accidents. With non-slip epoxy flooring, you’ll protect both your flooring and your employees. Commercial kitchens are held to high sanitary standards, and epoxy floor coatings can help. These flooring options won’t deteriorate and are resistant against fungus, mold, staining and foul odors. When installing epoxy coatings in your commercial kitchen, you will want strength and durability without sacrificing a professional appearance. Our flooring solutions are available in a variety of different colors so that your space still looks appealing while increasing durability and safety factors. At the end of a long day at work, you don’t want to spend a lot of time cleaning your floors. With epoxy coatings, you can simply clean your non-porous, waterproof surface with a little water and degreaser before removing it with a deck brush. Ask us about our unique, decorative metallic epoxy flooring. These are an excellent option for enhancing your curb appeal with an unforgettable finish. At Hardrock Coatingz, our highly-knowledgeable epoxy installers can provide all of your commercial kitchen epoxy coating needs in Tiverton, Rhode Island and the surrounding areas. We are located minutes from Providence, New Bedford and Fall River. We will travel to Cape Cod and Boston. Contact us today for a free estimate and analysis of your floor.